When you’re having an outdoor ceremony, it seems like the biggest concern is the weather. While it is a valid concern, there are other things to take into consideration as well. When I thought I was going to have an outdoor wedding, I often wondered “what if it rains”. Until someone said, “well what if it doesn’t?” from then on, I focused on the little details that would make our outdoor ceremony something everyone would enjoy (especially since it’s outdoors!). No, I didn’t come up with crazy gimmicks that would turn my wedding into a circus, but I thought of our guests a lot. Have you ever been outside while on your break at work in the middle of the afternoon? Chances are you looked for the shaded area to just relax. Right now, Starbucks is having their happy hour where their frapuccinos are half price from 3pm – 5pm. Why is that? Because that’s where being outside on a hot day is unbearable. Don’t get me wrong, I love the sun but even I can’t stand being exposed to it for long. So with our ceremony scheduled at 4pm, I can only imagine what my guests would have to endure during that time. I remember a wedding I went to where the venue had no shade at all and the ceremony was at 4pm. It was like sunbathing with make up and a very nice dress on. Not a great feeling. Today, Inspired Bride would like to share some ideas with all the brides who are having an outdoor ceremony this summer. For our wedding, I bought about 100 bottled water and made personalized labels for each one and thought of putting them in a bin full of ice for guests to take when they need something to cool them down. We had our bridal party come one Sunday afternoon to help us take the labels off, then put the new ones in. A good alternative to this is to setup a table with pitchers of iced tea and lemonade. 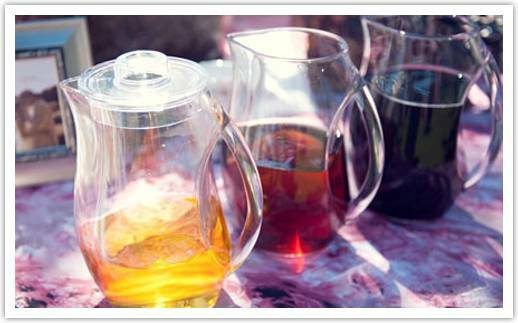 Whichever one you choose, your guests will definitely appreciate the thought. 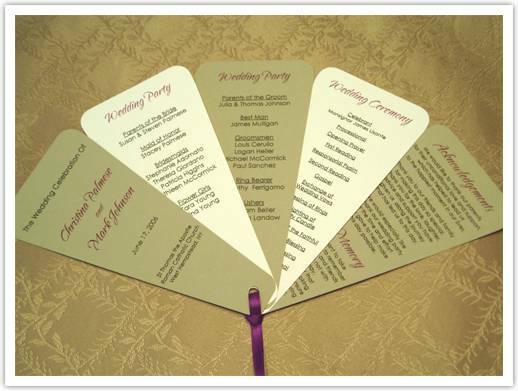 Most weddings have programs printed out to let the guests know what will happen during the ceremony. For this, my friend and I were supposed to put together a program fan with the program on one side and a trivia game on the other side. This will help cool your guests down when needed, keep them informed and keep them entertained as well with the trivia provided. 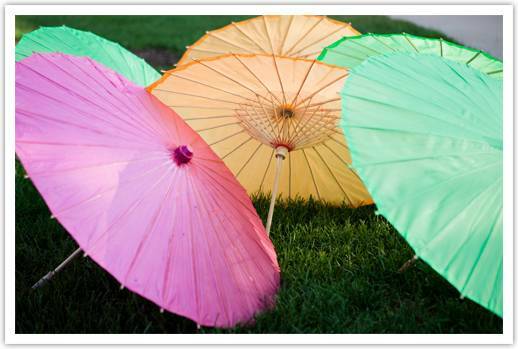 Because our venue didn’t allow us to bring in tents to protect our guests from the sun, I considered getting about 50 parasols for our guests to use for this purpose. I thought of putting a note saying “please take one per family”. This is to make sure that most of your guests get one. Not just the first 50 guests to arrive at your venue. Nothing can stop listing this romantic moment! These clear dome umbrellas really did the trick. Often called “heaven umbrellas”, these clear rain-stoppers allowed this couple to shoot in the rain and capture this incredible wedding and still look really pretty amazing.